The apartment in the "estate Lucia" is located on a semi-altitude surrounded by olive trees and vineyards in the heart of the Siena region between Asciano and Sinalunga. The estate from the 17th Century is today lovingly managed by the owners. There are produced high quality organic olive oils and wines, which guests are welcome to taste. Overall, the property consists of 5 apartments and 3 B & B rooms. Even the approach on the meandering road through the Tuscan countryside, the anticipation of the holiday can be guessed. A small gravel road leads you directly to the parking lot next to the property. 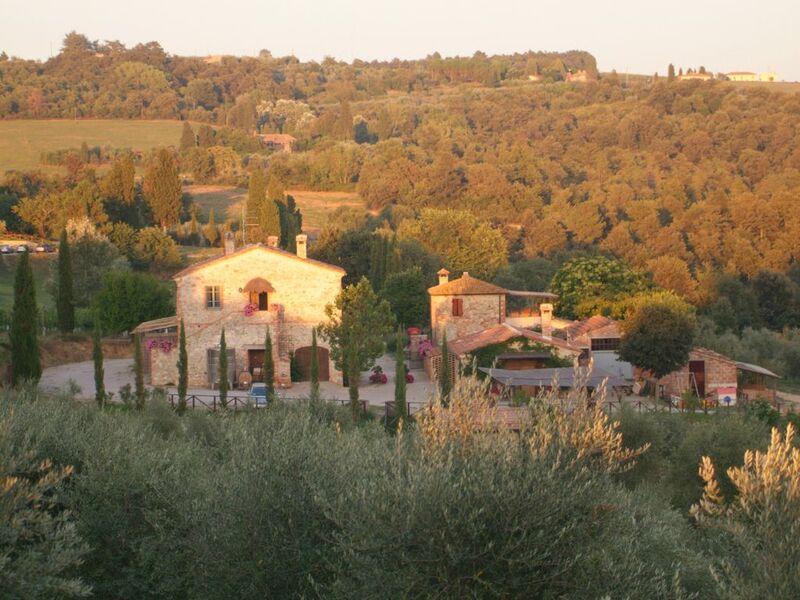 Once there, you already feel, here is an ideal place to relax and to enjoy the Tuscan sun and tranquility. This apartment is located in the 1st. OG on the back of the property turned away from the parking lot. In front of the front door you already have a view over the pool in the vastness of Tuscany. When entering the open 25 sqm living and dining room with kitchenette and Tuscan Maissonette character, you feel immediately at ease. The space is dominated by a spiral staircase leading to the upper duplex area. Overall, you can feel the Tuscan character with exposed beams and terracotta tiles. The well equipped kitchenette with dishwasher is seen left of the front door. A table with five seats offers enough space for the whole family. The open fireplace with the chairs in front, offers you a cozy place. From the living room a door opens into the master bedroom with a double bed (180 x 200 cm), where a bathroom en suite adjoins. This is equipped with shower, toilet, bidet and sink. The spiral staircase leads from the living room to the upper duplex area of ​​the apartment. This has a height of about 2,20m. A pull-out sofa can accommodate two people and can also be converted into two single beds. These sleeping places also have a bathroom en suite. Outside, at the bottom of the stairs is a table for four. So meals can also be taken outdoors. The 6 x 12m large, well-kept pool can be used by all guests and is about 30 meters from the apartment. This estate offers a free wine tasting. Here you will be presented with the self-grown organic wines. For a fee, breakfast or a cooking class can be booked. LOCATION APARTMENTS ASCIANO PIANARELLA: The "Lucia country estate" is situated on a semi-altitude location surrounded by olive trees and vineyards between Sinalunga and Asciano in the heart of Tuscany. The secluded estate is particularly well suited to visit the various well-known wine regions in Tuscany. ACTIVITIES HOLIDAY APARTMENT ASCIANO PIANARELLA: tennis in Sinalunga about 9 km, golf about 18 km away (Valdichiana Golf Club), painting, photography, hiking, cycling - personal trainer or bike guide can be booked for a fee, wine and oil tasting , Wellness / thermal baths in Rapolano thermal baths about 14 km away. Various weekly markets (Sinalunga, Asciano, Lucignano) within 10 km.